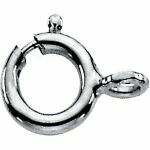 Description: Sterling silver round spring ring clasp for chains. The connector ring is opened and seamless to allow for easy attachment. Soldering seam closed is recommended. Sold individually. Outside diameter is 5.0mm with an inside diameter of 1.4mm on the connector ring. Outside diameter is 5.5mm with an inside diameter of 1.1mm on the connector ring. Outside diameter is 6.0mm with an inside diameter of 1.8mm on the connector ring. Outside diameter is 7.0mm with an inside diameter of 1.4mm on the connector ring. Outside diameter is 8.0mm with an inside diameter of 1.9mm on the connector ring.